We’ve seen several new phones launch at T-Mobile with 600MHz LTE support recently, and it looks like we’ll be getting another one this week. Support pages for the LG Q7+ appeared on T-Mobile’s website today. 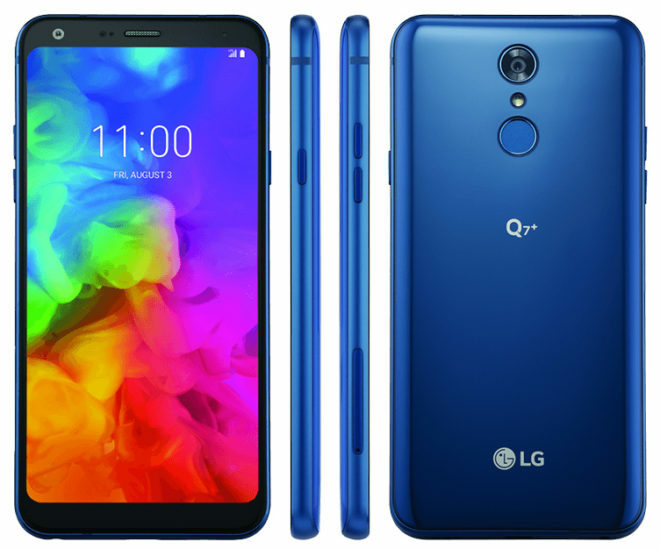 These include a software updates page that lists the LG Q7+’s launch software as being “available August 3, 2018.” This suggests that the LG Q7+ will be released by T-Mobile this Friday. When it comes to specs, the LG Q7+ features a 5.5-inch Full HD+ display, octa-core Snapdragon 450 processor, 4GB of RAM, and 64GB of built-in storage along with a microSD card slot if you want to add more storage. There’s a 16MP rear camera with phase detection autofocus included, too, along with an 8MP front-facing camera and 2890mAh battery. This Android Oreo phone also offers IP68 water and dust resistance. T-Mobile says that the LG Q7+ works with LTE Band 71, aka 600MHz LTE. The phone’s spec list includes LTE bands 2, 4, 5, 12, 66, and 71, as well as LTE Roaming Bands 1, 3, 7, 13, 20, 38, and 41. There’s no word yet on how much the LG Q7+ might cost when it launches at T-Mo. Its specs indicate that it sits somewhere in the mid-range tier, so it shouldn’t be too hard on buyers’ wallets. Stay tuned and I’ll update you with more as it becomes available. I’ll bite- $599-$650 in select stores, $499-$525 @Tmo. Me too,i like it over the moto e plus..If it is more than $300,Moto e it is! The G series are in that range. The Q series are in the 250 to300 dollar range. Do you t hink it will cost around $250–a price I can afford? You’re correct…too bad the size. Wish all came in @ Stylo size. I’m also debating between Lg Stylo 4 and Moto E5 Plus. If this has a good price tag then I might get this. I’ve been using all kind of smartphones and since I’ve a horrible hobby of switching phones I bought the Stylo 4 as a backup for when I sell my current phone. It’s an good phone for the price. I have a Moto z2 force I think has a similar battery to this… I get almost two days worth bruh. If you’re getting almost two days on that battery size, you’re not using your phone that much. And don’t try to tell me you’re heavy user. I have the Z2 Force and the Moto Mod battery pack and get a day (20% left) out of it. You definitely don’t use your phone that much. Zero YouTube, zero social media. Odd, TMO only carries expensive phones and cheap phones. There are no mid range phones offered. Ask 10 people this question, and get 20 different answers, some interspersed with additional maybes, althoughs and assorted hedges. The main problem is most people’s definitions of entry and mid -level have not sufficiently advanced with the times. Plus, plenty small people / eyeglass wearers prefer small phones / lesser resolution(larger text & icons). And worse, mid-tier unlocks often keep those good spec models overseas…giving us on this side pretty much entry level variants with one or two more advanced features…to surprisingly little protest– heavy on the fluff and glitz but light overall substance seems to be selling well these days. Any phone @ under 1080 res, under 6″ screen size(or just make 5½ & 6¼ inch variants) , under 64gb storage, under 4 gb ram, no NFC, no usb-C & under usb2, no SD slot(for those of us who travel a lot, phones should have BOTH sd slot AND dual-sim slots)… should NEVER be labeled mid-tier. It’s not only severely under-specced from the get go, but fairly soon will be a bloated, molasses-slow mess(without advanced tweaking and other measures not only time-consuming but that may void warranty and block certain work, pay, banking, betting, etc. apps). Hopefully that headed off those who will suggest rooting and putting apps on SD– if one is obligated to do that to still get good performance, then the phone is nothing more than entry level. For me, a mid tier phone has to have a SD 6xx chip at the very least. 5xx and 4xx chipped phones are entry level, So based on this, I don’t believe TMO currently has any mid-range phones. Been this way for a long time. It’s hard to convince people who walk into stores to spend an extra $200 based on specs when the phones pretty much all look the same and out of the box pretty much feel the same. And you can’t sell them a mid-range based on the “that phone is going to run like crap in a couple weeks compared to this one” excuse we all know to be true – it makes the T-Mo brand look like they are trying to pull one over on you. So the solution is to just not carry phones that are based on the SD6xx line and sell last year’s flagships as the mid-range instead. Apart from companies that cant supply enough and in a timely manner, I’m starting to think LG & Samsung give Tmo a list of specific models or spec/price combos that are off-limits(yeah, i know it’s illegal). This way customers don’t really have a choice but to buy their brands– esp. the flagships. One flagship’s total world sales can boost or tank securities pricing for that year. This way there’s no temptation to buy a (lower-priced)flagship-killer/junior. Those would be some high-end specs if it weren’t for the FHD screen and the small battery. Curious that it supports subset bands 2 and 5 but not their supersets, bands 25 and 26. The hardware should support them so this was a choice on their part to remove support via software. If it wasn’t for that then it would have support for all of Sprint’s bands (25, 26, and 41) in case the merger happens. I’m getting tired of carriers and manufacturers crippling band support. Don’t understand Tmo,they could of ask for the Stlyo 4plus,instead they get this phone 4/64. Just smh at there thinking,why didn’t Lg made this phone 5.7 to 6″? Exactly,I’d be more inclined to get the Stylo4 w/3GB RAM (BTW,an unlocked Stylo+ is available @ B&H Photo-Video for $299,it has the 3GB RAM). There seller on Ebay,that sell brand new V-20,Lg G6 for less than $300.00(No not me I wish!) The store is base in NYC,G6 you can get sd card from 32 to 256,with 2 yrs warranty,either one,both less than $300. When go on Ebay just put in Lg v-20,Lg G6,the store should come up.